Have two team peel and cut a banana into equal parts (don't tell them what comes next when they are cutting). 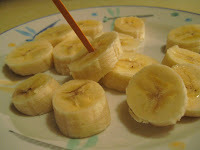 Then tell them they must put the banana back together using toothpicks, needles, tape, whatever. The team with the best reconstructed banana wins.